190 pages | 3 B/W Illus. Unaccompanied minor migrants are underage migrants, who for various reasons leave their country and are separated from their parents or legal/customary guardians. Some of them live entirely by themselves, while others join their relatives or other adults in a foreign country. The concept of the best interests of a child is widely applied in international, national legal documents and several guidelines and often pertains to unaccompanied minor migrants given that they are separated from parents, who are not able to exercise their basic parental responsibilities. This book takes an in-depth look at the issues surrounding the best interests of the child in relation to unaccompanied minor migrants drawing on social, legal and political sciences in order to understand children’s rights not only as a matter of positive law but mainly as a social practice depending on personal biographies, community histories and social relations of power. The book tackles the interpretation of the rights of the child and the best interests principle in the case of unaccompanied minor migrants in Europe at political, legal and practical levels. In its first part the book considers theoretical aspects of children’s rights and the best interests of the child in relation to unaccompanied minor migrants. Adopting a critical approach to the implementation of the Convention of Rights of a Child authors nevertheless confirm its relevance for protecting minor migrants’ rights in practice. Authors deconstruct power relations residing within the discourses of children’s rights and best interests, demonstrating that these rights are constructed and decided upon by those in power who make decisions on behalf of those who do not possess authority. Authors further on explore normative and methodological aspects of Article 3 of the Convention on the Rights of a Child and its relevance for asylum and migration legislation. The second part of the book goes on to examine the actual legal framework related to unaccompanied minor migrants and implementation of children’s’ rights and their best interests in the reception, protection, asylum and return procedures. The case studies are based on from the empirical research, on interviews with key experts and unaccompanied minor migrants in Austria, France, Slovenia and United Kingdom. Examining age assessment procedures, unaccompanied minors’ survivals strategies and their everyday life in reception centres the contributors point to the discrepancy between the states’ obligations to take the best interest of the child into account when dealing with unaccompanied minor migrants, and the lack of formal procedures of best interest determination in practice. 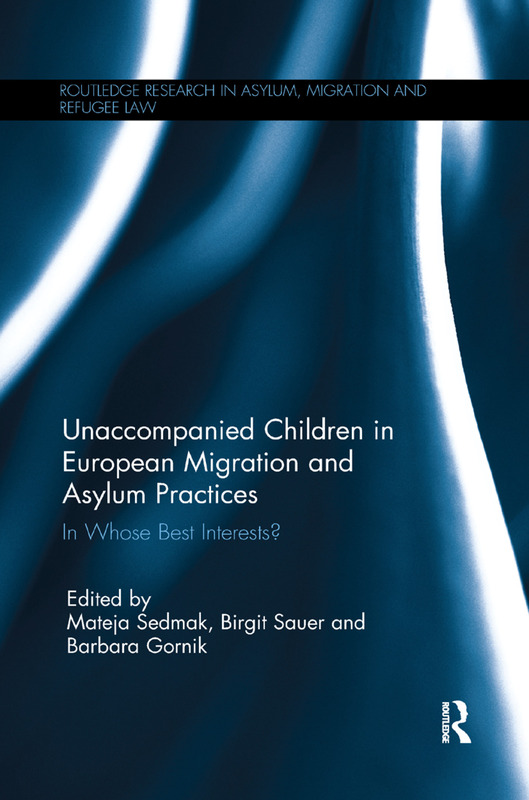 The chapters expose weaknesses and failures of institutionalized systems in selected European countries in dealing with unaccompanied children and young people on the move. Mateja Sedmak is a Research Councillor at the Science and Research Centre Koper, Slovenia. Barbara Gornik is a Research Assistant at the Science and Research Centre Koper, Slovenia.